Niko Bellic aiming a sniper rifle at gang members in Grand Theft Auto IV. Niko Bellic taking cover behind a wall in GTA IV while wielding a sniper rifle. The Sniper Rifle in GTA III, GTA Vice City, GTA San Andreas and GTA Liberty City Stories. A Sniper Rifle is a recurring weapon in the Grand Theft Auto series, having been featured in every Grand Theft Auto game since Grand Theft Auto III with the exception of Grand Theft Auto Advance. It is a special type of rifle that is very accurate and powerful, and can kill targets from long distances. It is often required in missions to shoot enemy gang members at a distance, especially when the goal is to protect an ally from far away. At long range, the sniper rifle usually provides a stealth kill, however it is not silenced, and should be fired far away from pedestrians and police. The rifle's magnifying scope is a valuable reconnaissance tool, and is also useful for viewing small game details like magazine covers and in-car objects. Like in many computer games, the rifle's bullets fly straight to the targeted point (it is a 'hitscan' weapon) - real life variables like distance, wind, or target movement don't affect the bullet. In Grand Theft Auto III, Grand Theft Auto: Vice City, Grand Theft Auto: San Andreas, Grand Theft Auto: Liberty City Stories and Grand Theft Auto IV, the sniper rifle is based on the Remington 700. Grand Theft Auto: Vice City Stories is the lone exception; its sniper rifle is based on a Springfield M21, reflecting the game's setting of 1984, but it functions incorrectly as a bolt-action rifle. In Grand Theft Auto V and Grand Theft Auto Online, the sniper rifle is based on the Arctic Warfare Super Magnum. The GTA IV Sniper Rifle is said to be twice as powerful as the Combat Sniper rifle; it is, however, a bolt action rifle, and thus can't fire nearly as fast. It provides a one-headshot kill in single player and multiplayer, unless the target is heavily armored. The sniper rifle only appears in certain missions of Grand Theft Auto: Chinatown Wars, where the player has to assemble the rifle using the touch screen. The whole top screen is then used to display the scoped view. It is modeled after a Sako TRG-42. In every Grand Theft Auto game in which this rifle has been featured in, the player can only fire the rifle in first-person mode and in bolt action firing mode. 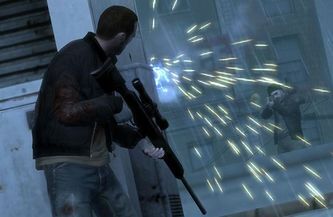 However, in the GTA IV Era, if the player is in cover, the player can fire it in third person mode using the crosshair provided. The rifle can also be blindfired. This is a very useful feature, as it can kill targets at a very far distance while staying safe behind cover and maintaining a clear view of the player's surrounds, therefore spotting potential targets to hide from or eliminate first though still has a bolt action fire rate. In GTA IV, during first-person aiming, if the player is standing, there is a noticeable movement of the scope due to Niko Bellic's breathing. This can be minimized by crouching. The Sniper rifle delivers a one-headshot kill in single player and multiplayer, unless the target is armored. It will also kill with about 3 shots to the body. It can easily take down drivers, motorcyclists and, with patience, helicopter pilots. Belleville Park, Staunton Island - On top of the building south of the Belleville Park Fire Station behind the MSX FM sign (and next to the body armor icon) (use the angled edge of the Shoreside Lift Bridge Loop to jump to it). Newport, Staunton Island - Available to buy from Ammu-Nation after completion of Last Requests ($10,000). Cochrane Dam, Shoreside Vale - In the trees along the path to the base of the Cochrane Dam from the main entrance (near Cedar Grove). North Point Mall - Available to buy from Ammu-Nation after completion of Phnom Penh '86 ($1,500). Starfish Island - In the hedge maze at the west part of the Mansion. Viceport - On the ledge on the south side of the base of the south bridge housing at the west end of the South Bridge that connects Ocean Beach and Little Havana. Hepburn Heights, Portland - On top of the construction site roof (to get it use the ruins of the doll house as a ramp). Torrington, Staunton Island - On top of the large star monument. Francis International Airport, Shoreside Vale - Underneath a small wooden ramp/bridge leading to Wichita Gardens. Cochrane Dam, Shoreside Vale - In the large tunnel entrance (tunnel leading to Cedar Grove). Starfish Island - Behind a mansion in the southern part of the island. Available for purchase from Ammu-Nation, Ocean Beach. Outside every safehouse after bursting eighty red balloons. The Sniper Rifle can be purchased from the back-alley gun shops for $6,000 and each additional magazine will cost $800. The weapon cannot be purchased from Little Jacob, Terry Thorpe, or Armando Torres; however, they sell the Combat Sniper for less than the standard Sniper Rifle. East Hook - Can be found on a gantry crane at the docks where the Platypus is berthed, which is located on Mohanet Ave. Specifically, the gantry crane closest to the bow on the starboard side of the ship. Steinway - Can be found atop a ferry terminal-type structure in Gantry Park, located off Dukes Drive. From the leftmost portion of the docks, the rifle is located atop the second structure. Northwood - Can be found atop a crude oil refining tower at the intersection of Exeter Ave and Grummer Rd, near the water's edge. The Sniper Rifle can be purchased at Ammu-Nation in Los Santos and Blaine County. Los Santos International Airport - Can be found at the radar tower. Climb the tower to reach the radar platform. Vinewood Hills - Can be found at the Galileo Observatory. It is next to the south-facing telescope. Palmer-Taylor Power Station - Can be found on the landing of the chimney stack. Paleto Bay, Water Tower - Use a helicopter or a parachute to drop down on the top of the water tower. The Sniper Rifle in GTA San Andreas has three weapon skills defined in the game's files, however only one is used in the game. The unused skill levels can be attained with cheats. From GTA III to GTA Vice City Stories, with the exception of GTA Advance, shooting the moon with the Sniper Rifle will make it bigger and smaller. The Sniper Rifle in GTA Chinatown Wars has the same firing sound as the Shotgun from GTA Vice City. In GTA V, it is possible to use the sniper rifle without the scope by using the "run and gun" mechanic. To do so, the player must depress the firing trigger halfway to bring up the targeting reticle, which is the same one used for assault rifles and light machine guns. "Running and gunning" with the sniper rifle is not practical due to the gun's low rate of fire and reduced accuracy while doing so. The Sniper Rifle's magnifying scope in action in Grand Theft Auto III. The Sniper Rifle's magnifying scope in action in Grand Theft Auto: Vice City. The Sniper Rifle's magnifying scope in action in Grand Theft Auto: San Andreas. 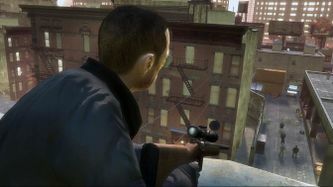 The Sniper Rifle's magnifying scope in action in Grand Theft Auto IV. GTA III, GTA Vice City, GTA San Andreas, and GTA LCS. The Remington 700 in real life seen in Grand Theft Auto III, Grand Theft Auto: Vice City, Grand Theft Auto: San Andreas, Grand Theft Auto: Liberty City Stories and Grand Theft Auto IV. A real M21 which was in GTA Vice City Stories. The Sako TRG-42 in real life which was in GTA Chinatown Wars. This page was last modified on 30 March 2014, at 08:12.